Marklin Trix H.O. 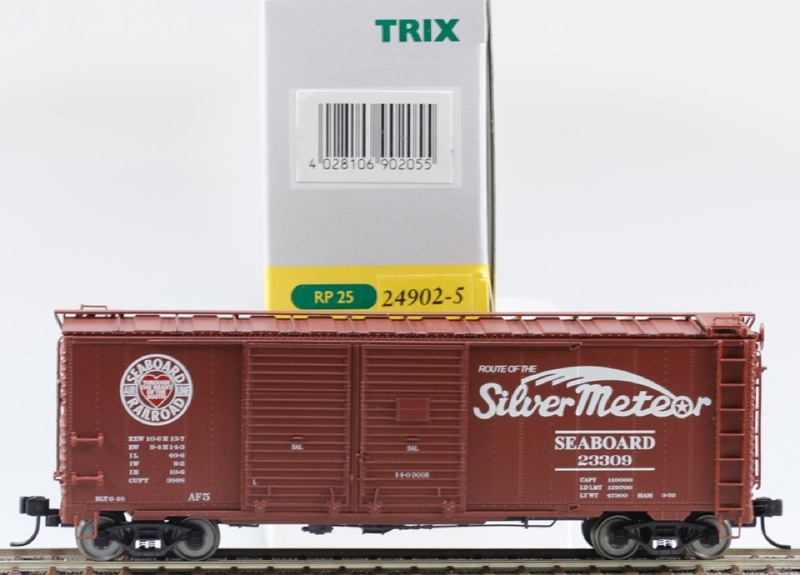 #24902-5 Seaboard Railroad Silver Meteor Double Door Boxcar. The model has a plastic body, metal frame and metal floor. The detailed trucks have RP-25 wheel sets. The model has sliding doors that can be opened. The Roof walk, ladders and other details are separately applied. It has NEM coupler pockets that allow the couplers to be replaced with other types. Car length over the couplers is 15.5 cm / 6-1/8 inches. This Car is brand new and unused, in the original Trix box. This car was available from Marklin from 2002 to 2006. Delivery by U.S. Mail is $6.00 to addresses in the USA. Insurance is included. Please send an email if you wish to purchase this item. We will send a PayPal invoice. Also if you are buying more than one item we will pack them together and ship at a combined lower rate. Please email for a shipping quote for delivery outside the USA. Massachusetts residents must add 6.25% sales tax.